An air terminal can be seen aboard this vessel, installed atop the radar support mast. Air terminals should be made of aluminum or copper rod, with a domed end facing skyward. Living and working on the Chesapeake Bay for the past two decades, I’ve learned many things about lightning, the most important of which is this: be skeptical of anyone who claims to be able to predict what it will do. Lightning in this region is incredibly intense, and second only to Florida for the number of boat strikes. Running a boatyard in the region for 11 years, I repaired scores of vessels that had been struck, even sunk. I’ve worked on boats that were struck ashore and afloat, dockside, at anchor, on a mooring, and under way. In one case, a vessel was struck, repaired, and then struck yet again before it could be retrieved by its owner. 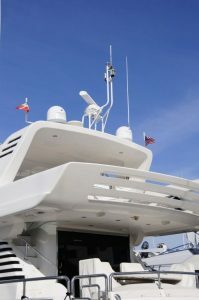 While I won’t claim to know how to to prevent lightning strikes, I can share guidance based on my experiences and understanding of the American Boat & Yacht Council’s standard TE-4, “Lightning Protection”, which may enable you to install a system that will prevent or at least reduce the degree of lightning damage. This is purely an interpretation of TE-4, rather than a discussion of alternative or supplementary methods of damage mitigation, of which there are several. My first assertion is vessels equipped with bonding systems, even those that are substandard, are less likely to suffer damage from a strike. Secondarily, a sound grounding system may also prevent damage to gear, electronics, etc. And as an aside I would add that there is no proof that a well-grounded vessel is more likely to be struck by lightning. 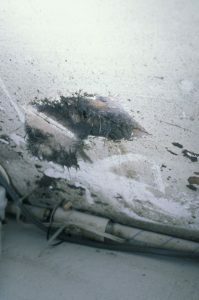 Damage at the inner cored hull of a trimaran, where lightning appeared to exit at the waterline. This vessel sank but not as a result of this damage, which did not breach the hull completely. Let’s look at two examples from my personal experience: The first, a 40’ (12.2m) sailing vessel is struck by lightning while dockside and unattended. It is relatively new and is equipped with non-metallic seacocks, an external ballast keel, and standard bonding system, one that for the most part meets ABYC E-2 and E-11 standards. The VHF whip at the masthead apparently takes the brunt of the hit, it melts, and stainless steel slag lands in the cockpit, burning gelcoat and the dodger. The VHF radio still works, as does all of the remaining gear aboard the vessel save a handful of blown-out light bulbs and small fuses. In the second case, the owner of a 36’ (11m) trimaran calls to report that his boat has sunk at his dock. It is roughly 10 years old, with no bonding system and non-metallic through-hull fittings, including the transducers. A salvage crew raises the vessel and transports it to the boatyard. I note that the remains of one of the transducers is hanging from its wire, which passes through its original mounting hole. The transducer itself is shattered, and there is damage (blown out FRP and core) below the waterline on the outboard side of the starboard balsa-cored ama; the hull structure is not breached except for the open through-hull where the transducer had been. Electrical systems, once dried out, show signs of damage, arcing, and overheating. The conclusion is the vessel was struck by lightning, which exited the transducer and hull, causing it to flood and sink. While bonding and AC/DC ground systems can reduce the damaged caused by lightning strikes, a system that complies with, or more closely complies with, TE-4 is preferred. Full compliance with TE-4 can be difficult, if not impossible, particularly the part about the hardware intensive and logistically complex temporary mast recommended for deployment when lightning threatens on all boats without a permanent mast. However, many vessels could be made to comply with the bulk of the standard. While I’m unable to review every component here, I will touch on those of the greatest importance, or most often misunderstood. The air terminal, or “lightning rod” in lubber’s argot, is “a device at the uppermost point of the lightning protection system that attaches a lightning stroke to the lightning ground system” (the emphasis is mine). It’s designed to bridge the gap between a lightning bolt and the vessel. Air terminals should be made from solid ⅜” (9.5mm) copper, or ½” (12.7mm) aluminum rod (the latter is better suited to aluminum spars), the top of which should be domed, and 6” (152mm) above the masthead or other un-grounded or non-conductive (essentially everything) structures. Ground terminals benefit from the longest possible edge length. Therefore, long ribbon-like rectangles are more efficient than squares. The ground terminal—essentially the other end of the system—connects the vessel’s lightning protection system to the sea. These must be metal—copper, copper alloy, aluminum, stainless steel, or lead—with a minimum thickness of 3/16” (4.8mm) and 1 sq ft (0.09m2) of surface area. Existing underwater appendages can fill this requirement, particularly an exposed ballast keel, shafts, struts, and rudders, provided they are nearly directly under the down conductor (more on that in a moment). In most cases that excludes everything but a keel; however, these other submerged objects may be electrically tied to the ground terminal, augmenting its effectiveness. For stand-alone ground terminals to provide maximum dissipation, TE-4 calls for the edges to be square, or sharp, rather than radiused and not filleted with caulk or fairing. 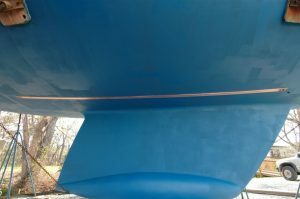 Some studies indicate that the edge does the heavy lifting in strike dissipation, so longer is better, making a rectangle more desirable than a square (the longer edge also reduces side flashes within the vessel). My preference is for a solid ¼” (6.4mm) thick, 1 or 2” (25.4 or 50.8mm) wide copper strip, a band of sorts, that runs parallel with the vessel’s centerline, amidships, or beneath the mast, that totals a minimum of 1 sq ft of surface area. Through bolts connect this to the hull, and serve as connection points for the primary conductor from the air terminal, as well as for secondary conductors from other bonded gear and underwater metals. 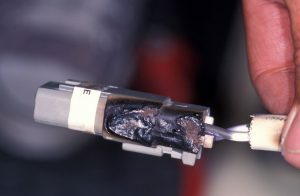 Lightning damage can be both puzzling and insidious, sometimes passing up seemingly attractive targets like antennas, but striking components buried deep within a vessel’s electrical system. The primary conductor, which runs from the air terminal (or the base of an aluminum or steel spar) to the grounding conductor, should be tinned stranded copper, and a minimum #4. It should be as straight and vertical as possible; bends, if necessary, must not exceed 90°, and radii no less than 8” (203mm). Secondary conductors, which connect other fittings—chainplates, tanks, engine blocks, rails, pedestals outriggers, etc.—to the grounding conductor, must be no less than #6, and also as vertical as possible while avoiding sharp bends. Lightning may be unpredictable, but even an almost-compliant lightning protection system will improve the odds of survivability for vessels operating in strike-prone areas. About the Author: For many years a full-service yard manager, Steve now works with boat builders and owners and others in the industry as Steve D’Antonio Marine Consulting. He is the technical editor of Professional BoatBuilder.